Loss Rate appears to be something kinda like the Interest Radar version of ANAR. 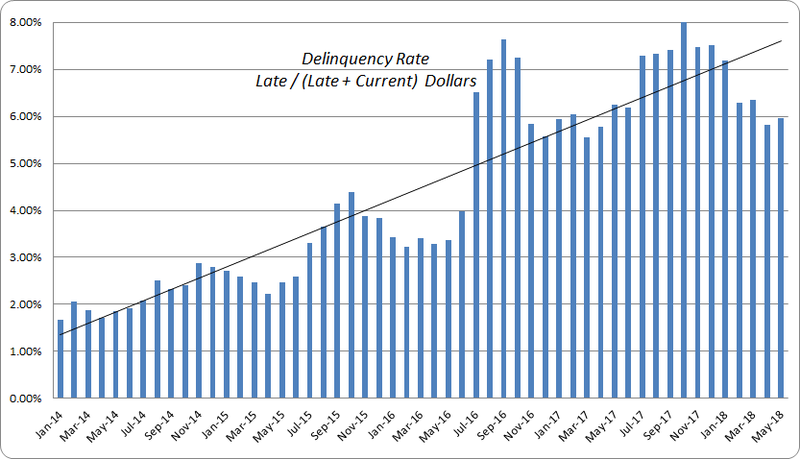 The only good news about April is the drop in delinquencies. But hey; that's something. 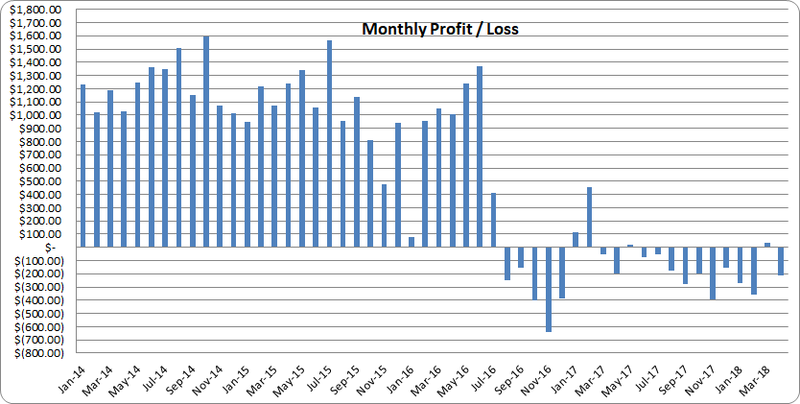 Wonder what my losses in a recession would look like? Ouch! Patiently holding on and waiting for notes to run off is an implicit bet that there will be no recession in the next two years. There's a coin toss for ya. 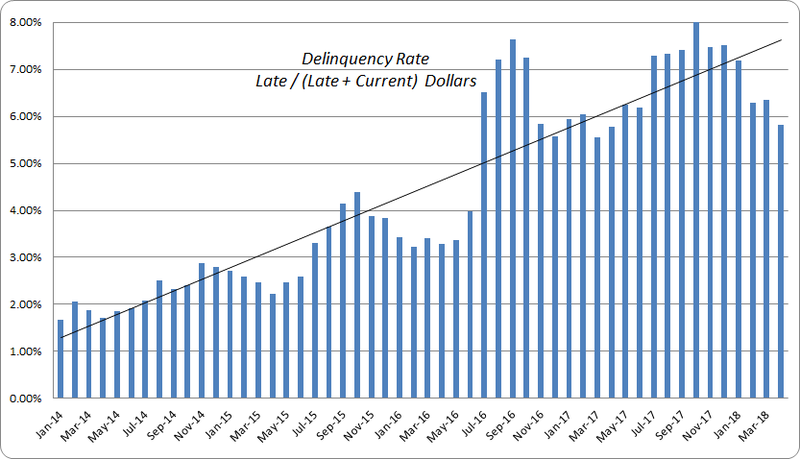 EDIT: Added an Excel drawn linear trend line to the delinquencies chart. No doubt the slope is substantially greater than it would have otherwise been without my selling off my best notes in the fall of 2016. But even if you bring the endpoint down from 7.5% to say 5.5% a very sharp up slope remains. Just tells the same old story that things definitely got much worse for D,E lenders over the time frame pictured. 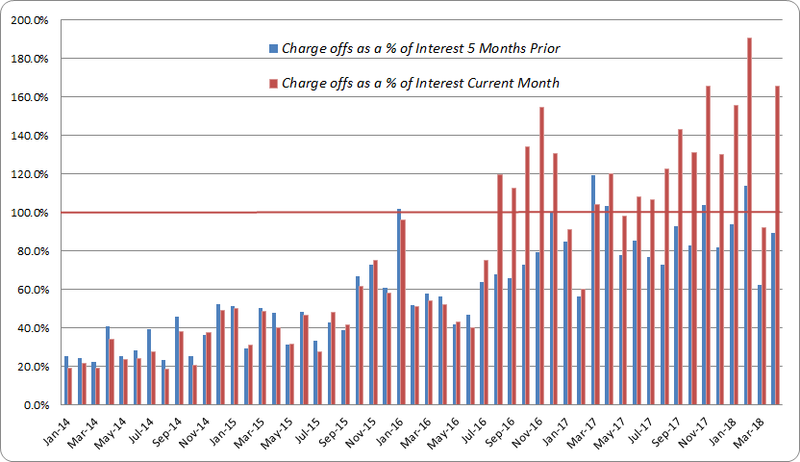 Also, take a look at the seasonality in the delinquencies chart. It's definitely there. There's always been a lull around this time of year (past 4 years, now this one). Wonder why? My assumption has always been the increase is the result of Christmas spending and the lull is the result of income tax refunds. Looks like we had a similar plan for a while albeit I think I was in some more conservative grades. Same old same old. Losing money slowly. 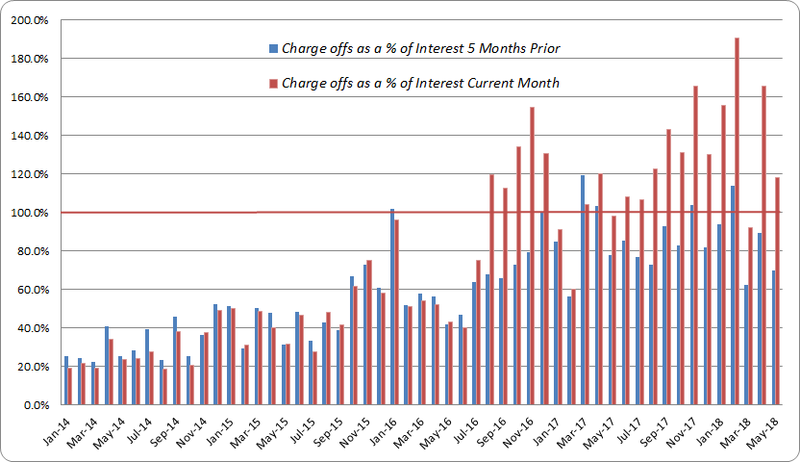 Delinquencies still following trend of past few years. Wonder if I'll see the usual "July spike" in a couple of months? I cringe when I see your charts every month. 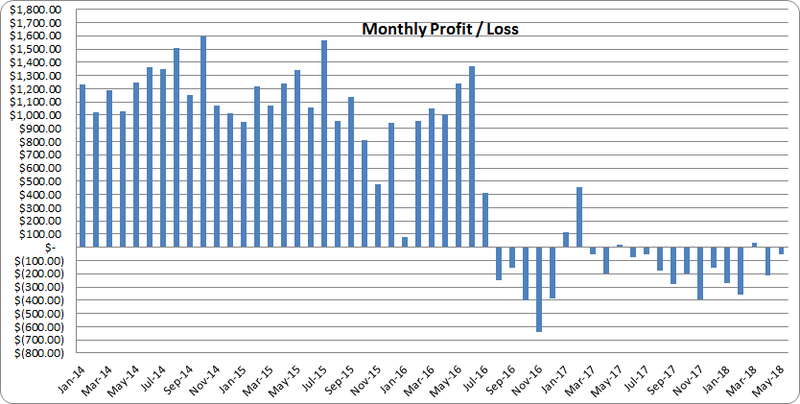 It just reaffirms I made the right decision last year when I started liquidating. I would have liked to have been as on top of things as you are with the charts and analysis, as I'm sure my numbers would have been similar, and as interesting. 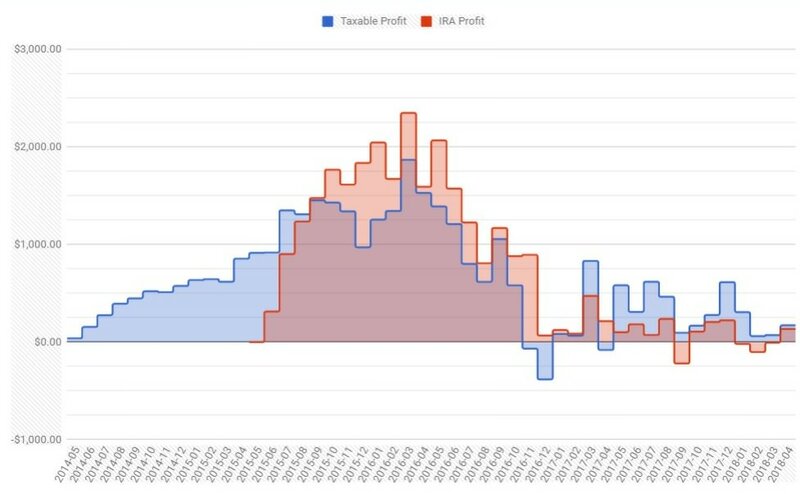 But I was too busy with trying to make my results better with manual operations, chasing the better "secret sauce", automation, and finally arriving at the conclusion that there were better investing options. 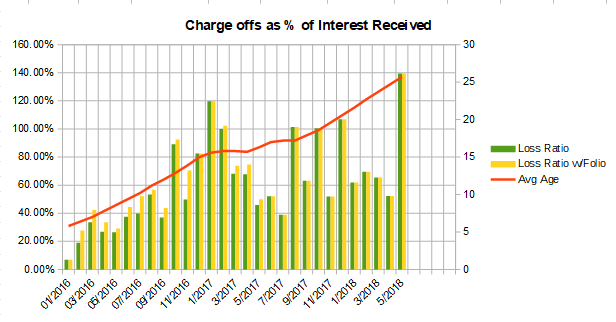 I say this with good intent- may your loans run off quickly and your losses during the runoff be minimal. My last IRA transfer left Strata today and is headed to Fundrise. All that's left for me is to see how many recoveries come in between now and November and if they amount to more than the $25 transfer fee-if they do I'll make one last transfer, then I plan to contact LC then and start the account closure process before the end of the year maintenance fee is charged by Strata. I put LC and Prosper data on the same chart. They seem mostly similar except that Prosper numbers bounce around a hellofa lot. I don't know why the LC numbers have jumped up recently. Could be statistical fluctuation. There have been movements around this size in the past that were just statistical wiggles, so shouldn't get excited about a couple of months of bump. I believe I'm getting about 5% return at both P and LC, after you average out the wiggles. In other words, I expect both the red and blue curve to continue to wiggle around 5%. Since I had been trying to cut my account size down I've been really passive about all this lately. Usually I just check out the monthly statement when ever this thread gets bumped, go oh, ok, and carry on. I hadn't even updated my tracking spreadsheet in 7 months... until today. OUCH month! Basically crushed 2018 profits in one hit. Still positive, but damn. I believe I'm getting about 5% return at both P and LC, after you average out the wiggles. In other words, I expect both the red and blue curve to continue to wiggle around 5%. Well somebody's making a little money around here! Nice to see! I wonder when the orchardindex is going to get updated. Its message is that things are better than a year ago - and much better than two years ago. I have seen this somewhat in my portfolio as well. I havent been following this thread very closely, I guess it's part of the learning curve. Good posts. I share your pain. 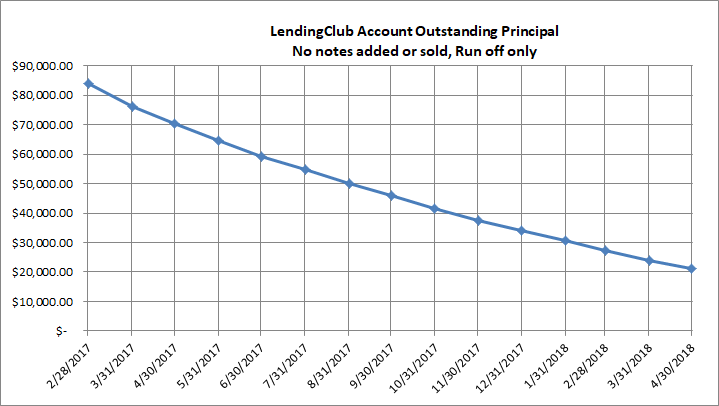 My biggest worry is that lending club has become fraud central for anyone who is about to declare bankrupcy. I'm 55 years old and I have been personally investing for 40 years in everything from EE bonds to REIT trusts to options trading. May I summarize in nine words or less? 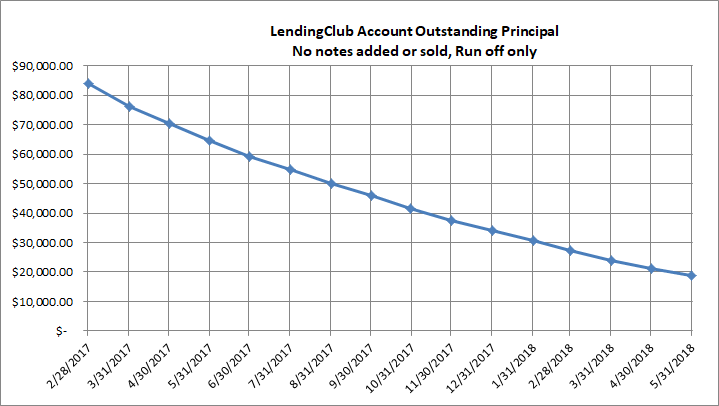 LENDING CLUB IS THE WORST INVESTMENT I'VE EVER MADE. Well I should qualify that. My LC Roth is the worst investment I've ever made, the regular LC account comes in second. The returns are disastrous, the amount of control is non existent, the amount of DAILY work is insane compared to investments with a similar return, the question of fraud, non-compliance and malfeasance both by the company and the borrowers is ever present, avoiding middle-men was the whole reason I got into this and they betrayed my trust when they went public, and the glide path for getting out of this nightmare is five years - during which, for the Roth, I have to keep a note balance of $10,000 or incur a $100 annual fee no matter how bad the account is tanking through no fault of my own, which means a little tiny window of eligible maturities as I hang on and wait. I wish I'd stuck this money under my mattress, or given it to a worthy charity, or maybe even flushed it down the toilet instead of giving it to a bunch of dishonest bureaucrats and outright deadbeat thieves who can't even manage their own credit cards, the pigs.